There are still 5 cats missing from their homes from around Bonfire Night, and we have 4 strays who have come into the Sanctuary since then & who have not been claimed yet. If you live in an area where there are fireworks our advice is to keep cats in overnight for a 3 week period around Bonfire Night. Christmas is approaching fast! Unbelievably people are still wanting kittens as Christmas presents!!! How can we get the message across that it is so wrong to do this? 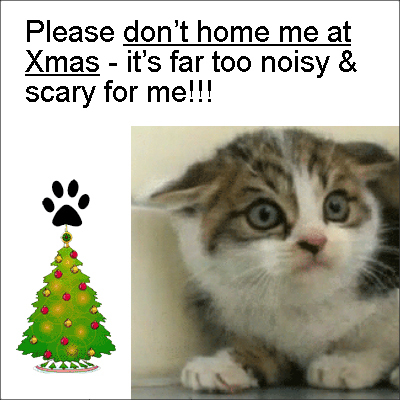 The kittens are upset by leaving the security of their mothers and homes to go to a strange very busy & noisy house at Christmas – you could not choose a worse time of year to home a kitten!! Our Christmas windows are looking great thanks to hard work by our volunteers. Our Christmas raffle is featured in one of our Newburgh shop windows – there are some great prizes! We now have catnip mice in our Newburgh shop – purrfect gifts for your feline friends! !